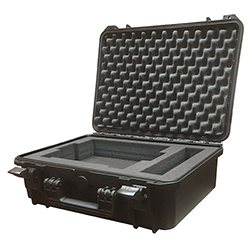 The CM-CU21 is a high quality, portable Commentator Unit. Its sturdy construction and flexibility of features make it suitable for use in a wide variety of environments. It provides two fully featured commentator positions and a third guest position that can alternatively be used as a line-level input. Each position has an individual output, with two additional outputs providing a mix of all active commentary channels. A limit indicator on the main panel shows when the adjustable limiter on the mix outputs is active, and a bright 21 segment LED PPM meter, which can be disabled, shows the main output level. 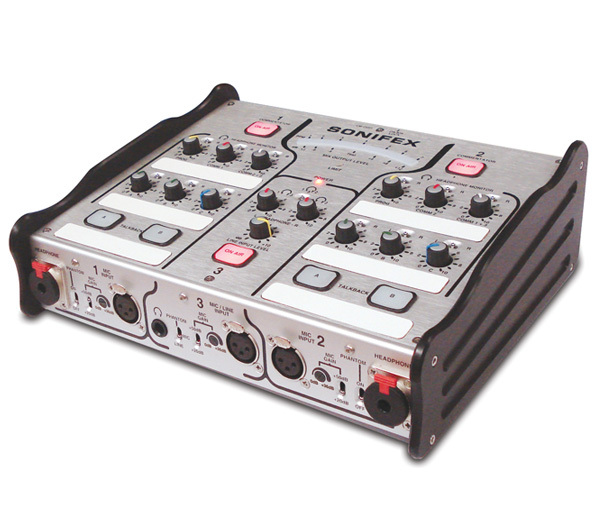 Two talkback output channels, with a built in limiter, are available to each of the two main commentators and they can be linked to provide simultaneous operation. A wide input gain range and switchable phantom power on each commentary position allows support of a variety of microphone types including low output ribbon, headsets and high output phantom powered microphones. There are 4 transformer balanced return audio inputs which, along with the commentator inputs, are routed to the headphone monitor controls. With these headphone controls, any monitor input can be adjusted and sent to either the left, right or both ears. A GPIO port gives an open-collector driven output indication of any active On-Air or talkback channel and four remote inputs provide an external call/alert to each of the talkback controls. The unit has a built in line-up tone generator for easy channel identification and cabling checks. When enabled the test-tone is routed to the required output simply by pressing the corresponding on air or talkback button. An On-Air lock switch prevents the On-Air buttons from being accidentally deactivated and a T/B Gang switch links the operation of talkbacks A & B. A flexible range of options allow the Commentator Unit to be customised to better suit the operational and user’s personal requirements. These include options for momentary or latching operation of the talkback buttons, permanently enabling or disabling any of the commentator inputs, default headphone signal routing and main panel indicator illumination levels. The CM-CU21 Commentator Unit can be powered from a universal mains input between 85-264V AC at 47-63Hz, or from a 12-24V DC input. 2 Commentator positions plus a guest position, each with individual outputs; plus 2 mix outputs. Talkback outputs selectable by the two main commentators, with built in limiter. 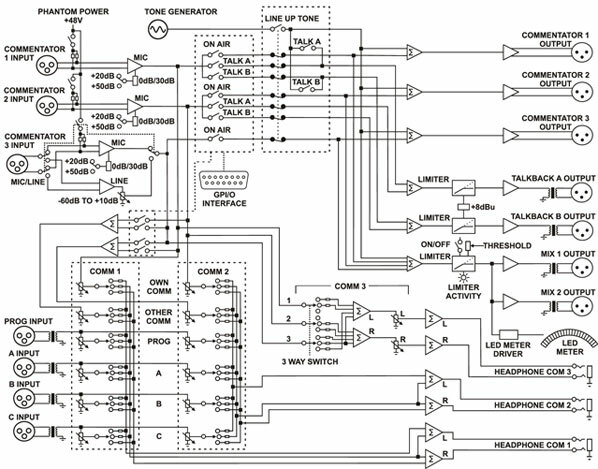 4 Return audio circuits that are routed to headphones along with all the commentator inputs. Any source can be individually level controlled and sent to left, right or both ears. A wide input gain range and switchable phantom power on each commentary position allows support of a variety of microphone types including low output ribbon, headsets and high output phantom powered microphones. Individually switched 48V phantom power on all microphone inputs. User preset adjustable limiter on main mix outputs with limit activity indication. Built in line-up tone for initial cabling checks. 21 Segment LED PPM meter showing main output level. Transformer balanced inputs and outputs. Fitted formica ‘Sharpie’ designation strips. Robust mechanical design with protection for potentiometer knobs. Universal AC mains, or 12-24 volt DC power.